Tic Tac Toe, artificial intelligence (AI), learning, history and options. This is my first attempt to write artificial intelligence software. In other words, software that can learn from experience and apply that knowledge to goal directed action, in this case to win or to avoid losing. Below is the Autoplay tab form to set the AI options. Random (R) - is suitable for people just learning how to play Tic Tac Toe. It is easy to prevail against this opponent. Strategy - Make a random move. 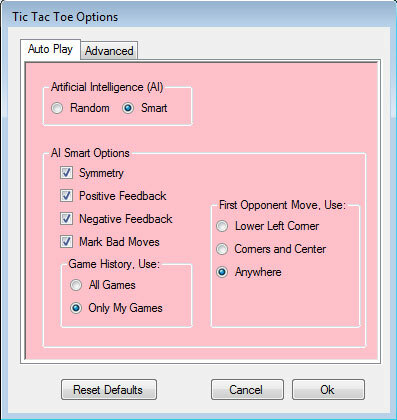 Smart - is suitable for average to advanced players depending on the sub options selected. Strategy - Win/Block (W) makes a winning move if available, else makes a blocking move if available, otherwise try next available strategy. Positive Feedback (PF), strategy - Compare current progress of game with history of previous games, choose a move that previously resulted in a positive outcome, otherwise try next available strategy. Negative Feedback (NF), strategy - Compare current progress of game with history of previous games, avoid moves that previously resulted in a negative outcome, otherwise try next available strategy. Symmetry - speeds up learning by a factor of four by applying rotational symmetry to the game. For example, if a strategy is learned for game sequences starting in the bottom left corner, then by using symmetry this strategy is used for all games which start in any corner. Mark Bad Moves - Bad moves are currently defined as moves that are not consistent with the Win/Block (W) strategy. These games are not considered by the Positive Feedback (PF) or Negative Feedback (NF) strategies. All Games - Very Hard to prevail in this mode with above strategies checked. Only my Games - This is the most interesting mode, you will see significant performance improvement within twenty games as the AI learns new strategies based exclusively upon games which you played. This includes games you played against other humans or in other modes. To start over just choose a new user name. Lower Left Corner - These were useful while training the AI. 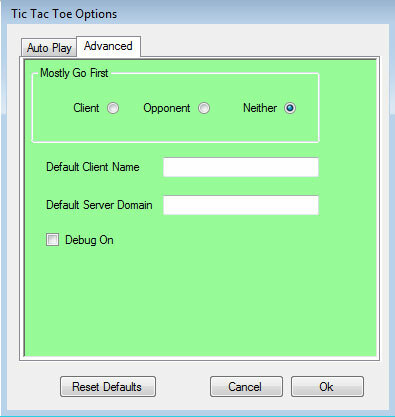 Below is the Advanced tab form to set options. Mostly Go First - Useful for training. Client - You go first, except for first game after challenge. Opponent - You go Second. Neither - You go first on alternate games. Default Client Name - Save your preferred user name to avoid typing it in every time. The AI will send messages telling you what strategy it used to make a move.